If you imagine the San Francisco Bay as a bathtub, sea level rise means the bathwater is rising. A new study published today in Science Advances finds the tub is sinking too, and in some places, more than others. 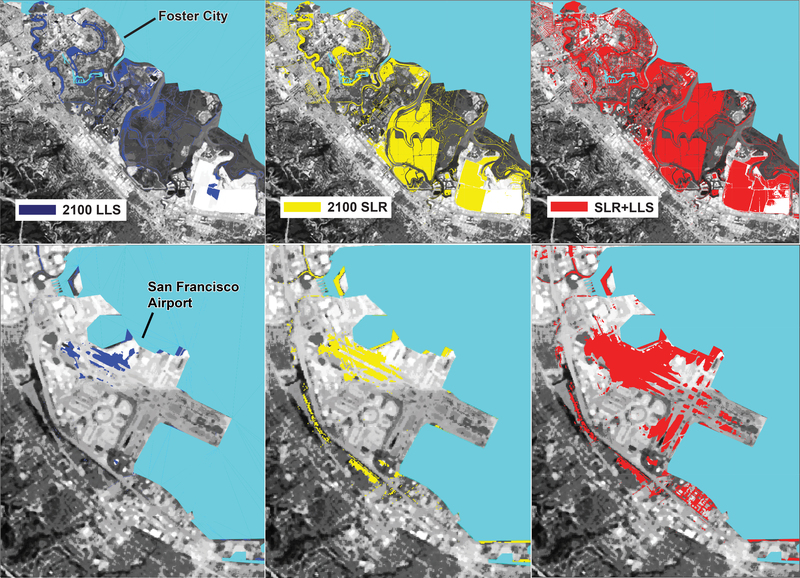 Where Bay Area cities have built on landfill or newer mud, that land is compacting, and sinking faster than other places. This subsidence is a problem for, among others, Foster City, Union City, San Rafael, and the land around San Francisco Airport. 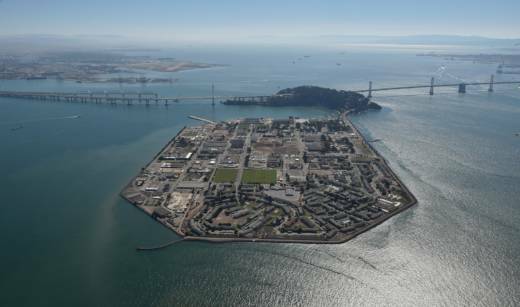 “The northwest corner of Treasure Island is subsiding really rapidly – half an inch or so per year,” says UC Berkeley geophysicist Roland Burgmann. He's a senior author on the study and worked with Manoochehr Shirzaei, a former postdoctoral fellow at Berkeley, now at Arizona State University. Burgmann and Shirzaei used an ultra-precise satellite radar system to map, for the first time, Bay Area land loss with exacting resolution. By combining projected land loss with sea level rise, the team concludes that by century’s end, 90 percent more land could be at risk of flooding than from sea level rise alone. 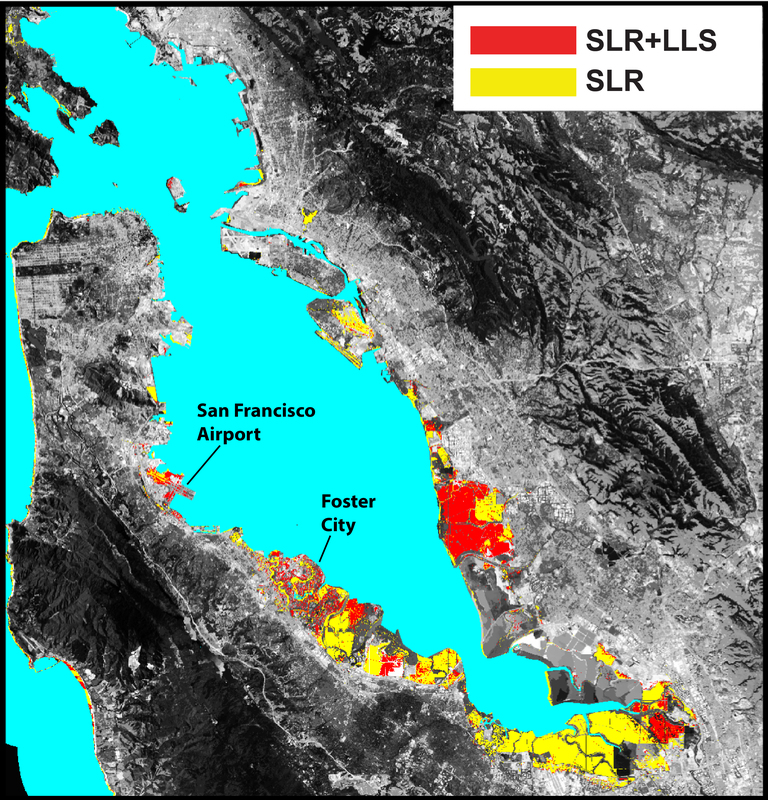 The effects of sea level rise are worsened in places around the Bay Area built on infill or mud that is sinking, say researchers from Berkeley and ASU. “These maps show where we should be pretty much underwater all the time on average,” Burgmann says. He cautions that the work only addresses flooding related to sea level rise and subsidence – essentially, what happens when you raise the level of bathwater while lowering the tub itself. But Burgmann notes that sinking lands and rising seas aren't the only hazards that affect flooding in the bay. “You have to add to that bathtub daily tides, storms every season and really big flooding events – then you have the full hazard story,” he says. Burgmann believes his team’s information and methods could help coastal planners prepare for acute hazards such as king tides, storms, tsunamis and catastrophic floods. Scientists haven’t very often done an analysis that combines land loss and sea level rise together, perhaps because, they say, subsidence data has not been robust. Barnard says USGS hazard assessments about flooding in the San Francisco Bay Area already rely in part on Burgmann's data and analysis. And it’s important to continue to develop more accurate land loss projections for the area. Burgmann's study also could prove valuable to at least one of the ten teams participating in the competition known as Resilient by Design. It’s funded by the Rockefeller Foundation and others with the goal of adapting to sea level rise in the Bay Area. Near Union City, a city vulnerable to both sinking land and sea level rise, an interdisciplinary team called Public Sediment is investigating the future of Alameda Creek – and team member Gena Wirth is eager to hear more. “People keep thinking that sea level rise is a future problem, but we actually have to act now,” says Wirth, a landscape architect with New York-based SCAPE Architecture. The Public Sediment team is considering ways to strategically breach levees and set sediment free, to nourish the mudflats and marshes that can protect East Bay cities from storms and high tide. Their proposal and those from nine other teams will be public in May.